After Belfast, I needed another manner of beauty that Ireland had to offer. I rose early, got in my little Ford, and headed up the A26 passing through Ballymena, Ballymoney, and Coleraine. My first stop was Dunluce Castle, a ruined medieval castle in Northern Ireland. These are the first pictures I have included here. An extraordinary place! Originally built in the 1200’s, its history was first documented around the beginning of the 1500’s and the castle would remain occupied until the early 1700’s. It is located on this rugged north shore and is accessible only by a small bridge, with very steep cliffs protecting it from attack on all sides. To me the castle remains remarkably intact and would allow my sometimes boyhood imagination to run rampant. How would I protect it if I were under attack or how would I gain access if I were attacking? What a gas! (This of course is why I visit old castles.) One story I heard was this; a lord brought his new wife to the castle after their marriage. Alas, she hated the incessant sound of the crashing waves. But she remained, unhappily. One night during a particularly vicious storm, the kitchen wall, which faced the ocean, collapsed and fell into the sea with many of the kitchen staff. The very next day, work began building a more suitable dwelling much much further inland. Over the years Vikings, Irish, and Scots would occupy the castle and from it, would lord over this northern land. Then I went on to the A2 traveling west. My next stop would be Giant’s Causeway, an astonishing UNESCO World Heritage Site. The geography is the result of volcanic eruptions 50 or 60 million years ago. These huge columns rise out of the sea forming hexagonal ‘steps’. Now the Irish have their own legends about the Causeway, but I see these as being the steps by which the masters of the land rose out of the sea to lay claim to this Emerald Isle. These ‘Giants’ would have an insatiable taste for an elixir of the land, beer and then Guinness, to make up for the lose of the sustaining water from which they came. I spent the next several hours wandering the rocks and the cliffs absorbed by the lore and the beauty of the day. And yes Tim, I even had a wee chat with some local shaggy, hair in the eyes, residents. But despite attempts on both sides, communication was limited, not the least because, the resident’s expressions were buried in a wonderful Irish brogue. 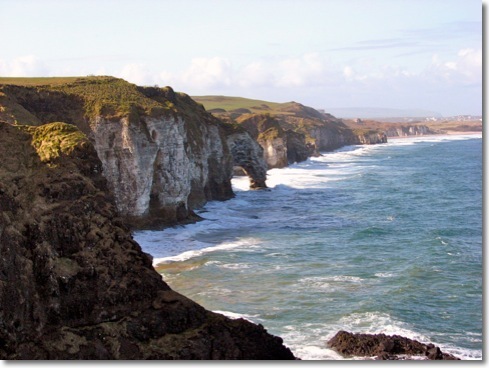 I would continue along A2 until I came to another Irish attraction, a rope bridge, The Carrick-a-Rede (Rock in the Road) Rope Bridge, a link to a small bird island. The bridge spans about 20 meters and is about 30 meters above the crashing waves below. The vista from the island is stunning and affords an unassisted view of Scotland on days such as these. Many Scottish names along this north coast are a result of warring parties from that Scottish land. I would continue along A2 all the way to Larne, a beautiful little town on the coast, the town from which my grandfather came. My grandfather left Ireland with his two brothers to settle in Saskatchewan some years before the First World War. He would return to Europe one last time, on this occasion with a gun, and return with a chest full of medals and an inability to speak of those years. My father would follow in his footsteps 20 odd years later, and return with even more medals and an even more severely damaged psyche. The road to Larne was exceptionally winding, and lent itself so perfectly to my new found love of driving on the left side of the road, with this little Red, 5 speed, 1.8 litreFord. However, saddled with thoughts of Larne, my father and grandfather, the trip back to my B and B in Randalstown has now completely gone from my memory of this last day I would spend in Northern Ireland.